Toni Loco opened his doors in October 2018, Albert Cuypstraat 59, in Amsterdam. No more than half a year later The Food Department opened Toni’s second location in Amsterdam’s historic building Magna Plaza. Curated by true restaurant visionaries, Toni Loco is more than your typical Italian-American style pizza restaurant. Yes, that’s right, ask your ‘consigliere’ and he will vouch for it. Featuring authentic 50-centimeter pizza made with a characteristically large hand-tossed thin sesame crust, in wide slices. Toni only chooses the best ingredients and strictly by-the-book authentic toppings with fresh tomato sauce and shredded mozzarella cheese. Toni doesn’t mess around with what’s right. Serving traditional pizzas with a modern twist, expect to indulge in an array of new tastes. Not compromising on the classics, Toni has it all; Bianca, Rosa, Olivio and tailor-made pizzas. Toni Loco serves a unique selection of artisan beverages, from craft beer, selected wines and premium Champagnes. But what’s dinner without dessert? Toni also serves it’s homemade gelato. Toni Loco’s interior is utilitarian with a touch of sophistication. A ‘one size’ concrete tile grid system wrap the floor and walls. Much like the purist approach to the pizzas, the interior is minimalistic with careful attention to detail. The raw yet refined interior is finished with round mirrors to draw attention to the heart of the space – the kitchen. 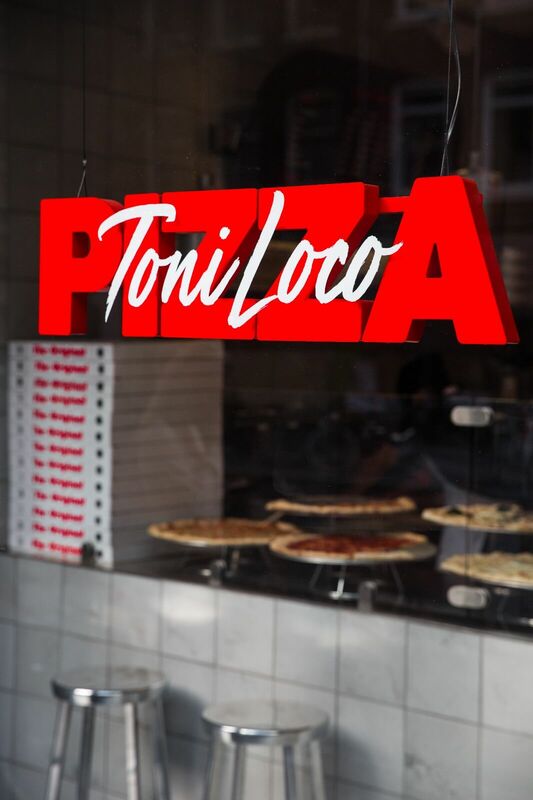 Toni Loco targets his audience on the vibrant scene of urbanites, uniting global communities in an Italian-American style pizza restaurant, an after-party hangout and always serving the best quality pizzas. During lunch, the afternoon, dinner, pre-clubbing or when nocturnal cravings kick in, Toni Loco will always serve up perfectionism. Toni Loco is devoted to using only premium quality products and sourcing fresh ingredients locally. Toni’s kitchen exclusively works with the highest quality ingredients. From the best dough to the selection of herbs, the fresh vegetables, the special signature tomato sauce and shredded mozzarella cheese. Constantly committing to creating more than just quality pizza. Start spreading the news, but remember to wipe the evidence before you leave.